Oregon is a proper noun. Oregon is (1) a state in northwestern United States on the Pacific. The following articles provide more information about the proper noun Oregon. Oregon is the 10th largest state in the USA, bordered by Washington, California, Idaho, Nevada, and the Pacific Ocean. Visit this site to learn more about Oregon and view the printable Oregon maps. Oregon's state capital is Salem. 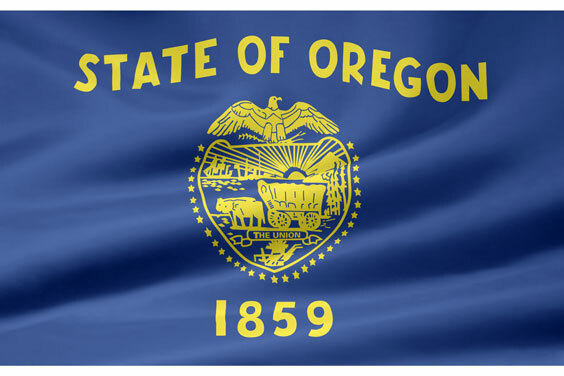 Learn about the Oregon state government operations and services. Find Oregon travel and tourism information, and read about living and working in the Beaver State. Learn about urban, suburban, and rural real estate markets in Oregon. Real estate agents, buyers, and sellers will appreciate the Oregon real estate resources on this page. Oregon state history, geography, and travel information are the subjects of this Oregon atlas page. OSU is a large school in Corvallis, Oregon with about 20,000 students. The school dates back to 1858 and ten years later became the State's land-grant university. The School has Pac-10 Conference athletics. This National Park directory page lists National Parks, Historic Landmarks, and Natural Landmarks in the State of Oregon. An interactive Oregon map, plus photos and highlights, are included thereon. This official web site for the City of Portland, Oregon features information about the city's government structure, budget, and programs. Learn about the services offered to residents, businesses, and visitors in the city of Portland. The Oregonian is a daily newspaper published in Portland, Oregon. It has been continually published since 1850 and is the largest newspaper in Oregon. The Oregonian is planning to cut home delivery to four days a week in October 2013. It will then focus on online news. Idaho is the 11th largest state in the USA, surrounded by the Canadian Province of British Columbia and the states of Nevada, Wyoming, Montana, Utah, Washington, and Oregon. Nevada is the 7th largest USA state, bordered by Utah, California, Idaho, Arizona, and Oregon. Visit this site to learn more and find printable road, topographical, relief and regional maps of Nevada. Washington is the 20th largest USA state, bordered by the Canadian Province of British Columbia to the north, the state of Oregon to the south, the state of Idaho to the east, and the Pacific Ocean to the west. Powell's began as a small bookstore in Portland, Oregon in 1971. Today it is a large enterprise with 7 branches in Portland and a successful dot com business which has been in operation since 1994. Users can buy used and new books, textbooks, children's books, rare books, and DVDs online. The website also offers browsing by subject and interviews, reviews, blogs, and more. The following articles provide recent Oregon-related news. ABC News. Wednesday, 24 Apr 2019 18:31:35 -0400. A police dog in Oregon is recovering after he was hit by 200 quills from a porcupine as he was chasing a suspect. Sky News. Wednesday, 24 Apr 2019 09:17:00 +0100. Newsmax. Tuesday, 23 Apr 2019 23:04:19 EDT. Washington Times. Saturday, 20 Apr 2019 12:23:55 -0400. Chuck Dobrosielski. Hotel Management. Friday, 19 Apr 2019 18:12:40 +0000. ESPN. Thursday, 18 Apr 2019 21:06:34 EST. Fox News. Thursday, 18 Apr 2019 16:58:30 GMT. BBC News. Friday, 12 Apr 2019 00:35:02 GMT. Rite Aid will start selling CBD creams, lotions and lip balms in Washington and Oregon this month, the company announced Thursday. CNBC. Thursday, 11 Apr 2019 12:50 GMT. The following digital image illustrates the proper noun Oregon.